"We are a team. We are a collective working toward the common goal of improvement. We work together to advance all aspects of our fitness. We challenge each other. We support each other. We suffer together. We achieve together. Your success is our success. We work hard and what we do is not for everyone. What we do is not exclusive, but we are different." The text seen above is found on the website of Evolve Fitness, a specialty gym located in Stockholm, Sweden. Evolve aims to help its customers cultivate higher levels of physical and mental wellness through customized programs and a more personal approach. Owner Anthony Sullivan's unique methodology has even encouraged individual members to participate in its development. Specifically, member Sandra Eloranta took on the task of creating a mobile app to further customize the gym experience. Originally Sandra thought she might code an app from scratch, but she quickly found the process much too consuming. Looking for tools to help her get an app with few coding requirements, Sandra found AppSheet. That's when she realized she could create an app from the data she already had, and without any coding at all. Sandra built a mobile app that tracks and tailors workouts for members. Upon joining the gym, each member is given a version of the app, which they then use to log their gym sessions, receive daily workout material and instructions, and chart progress. 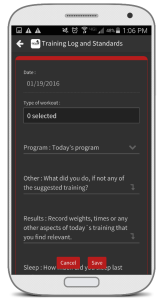 Tracking the results gives both the members and gym personnel the ability to fine-tune each program. Not only are members empowered to follow their own success, but the information recorded in the app helps trainers and coaches see, in real time, how each of them are doing. The synchronicity between members and gym staff fosters an atmosphere where everyone is working together toward one common goal. "We do try to encourage our members to be responsible for their work with us and I feel the app is one way of empowering them to really take a positive hold of their training and be accountable for themselves," says Anthony. It's a uniquely innovative approach to fitness, and one that is generating some impressive results. Over the last four months, users have logged over 1,000 workouts. With the app they've been able to revisit past workouts, enabling them to make small tweaks or try to beat their old times. It's providing a whole new level of connectivity between members and their progress, and between members and trainers. "We are extremely happy with what we have achieved with help from Appsheet so far... big thanks to everyone at AppSheet for this fantastic product. I'm reminded of it every time I set foot in the gym-- which is pretty much every day!"